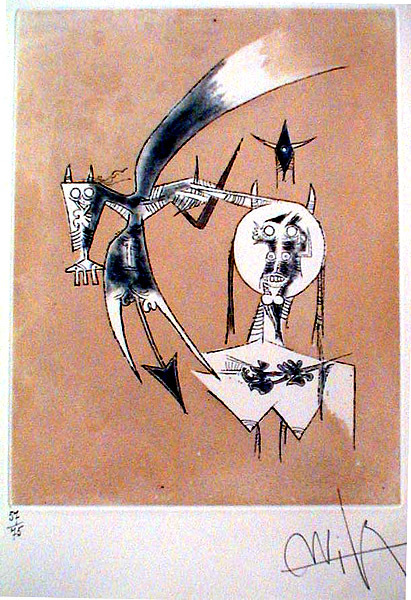 Wifredo Lam grew up in Cuba with a grandmother who practised Voodoo rituals and came of age in Paris, where he and Picasso became very close friends and artistic associates. 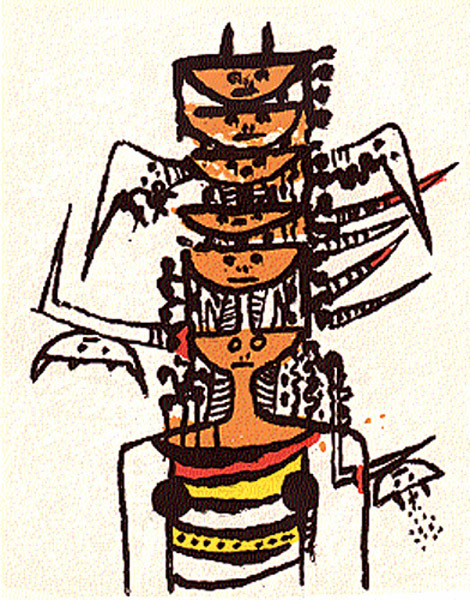 In 1939 he joined the Surrealists and he collaborated on a book, Fata Morgana, with André Breton, who wrote the text that accompanied Lam's drawings. After the Germans invaded France, Lam left Europe on the same ship as Breton and Masson, helped in part by the International Rescue Committee, in token of which, many years later, Lam contributed a lithograph to the Flight Portfolio as a fundraiser. 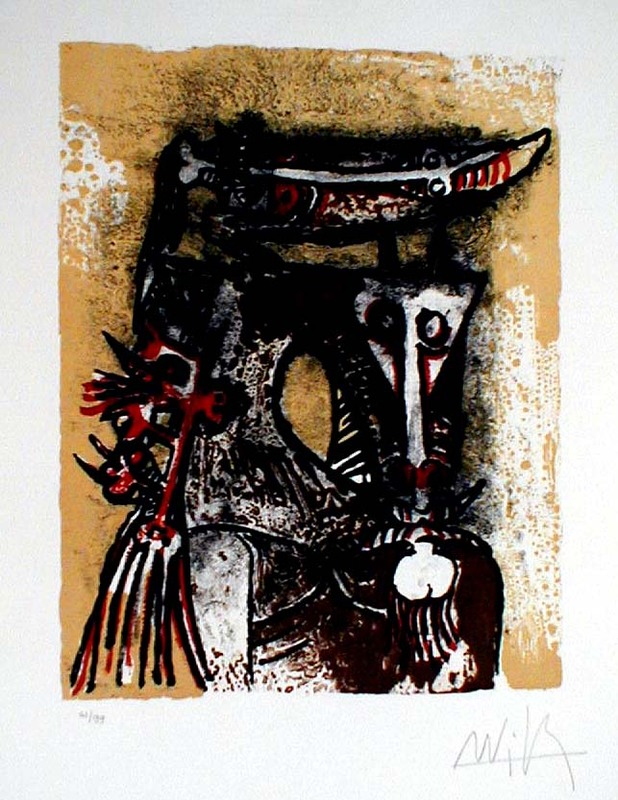 Returning to Cuba, Lam's work continued to mix Afro-Cuban and European influences. After the war, Lam travelled before finally settling in Paris, with side trips to Italy. Where Picasso and the German Expressionists turned to African art to revitalize European traditions, Lam combines these traditions not as an outsider but as a rightful possessor of both. His art offers the fantastic images of a living but alien tradition to a world needing to find a new conception of the civilized. Lam's works are to be found in many important collections of modern art including the Museum of Modern Art and the Guggenheim Museum (NYC) and the Tate; his works have been shown at major museums and important galleries in New York, Paris, Düsseldorf, Madrid (the Reina Sofia), Barcelona (the Fondation Miró), The Art Institute (Chicago), the Musée d'Art Moderne de la Ville de Paris, the Carnegie Institute (Pittsburgh), the Kassel Documenta (1959, 1960, 1965), the Stedelijk Museum (Amsterdam), the Venice Biennale (1972), the Museo de Arte Moderno (Mexico), the National Museum of Modern Art (Tokyo), and many others. Since his death, there has been an emerging consensus that Lam is one of the most important artists of the 20th century. Bibliography: General works: Maria R. Balderrama, Wifredo Lam and his Contemporaries 1938-1952 (NY: Studio Museum in Harlem, 1992); Bronx Museum of the Arts, The Latin American Spirit: Art and Artists in the United States, 1920-1970 ( NY: Abrams," 1988); Catherine David, Wifredo Lam (Paris: Galerie Lelong, 1991);Valerie Fletcher, Crosscurrents of Modernism: Four Latin American Pioneers. Diego Rivera, Joaquin Torres-Garcia, Wifredo Lam, Matta (Washington, D.C.: Hirshhorn Museum, 1992); Max-Pol Fouchet, Wifredo Lam. Trans. Kenneth Lyons and Richard-Lewis Rees. 2nd Ed. 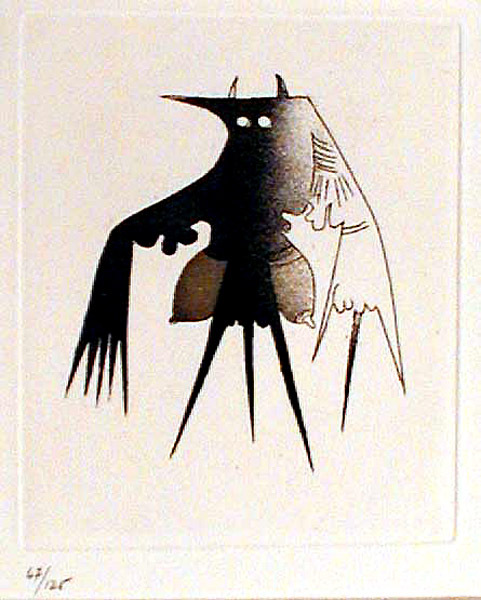 (Barcelona: Ediciones Poligrafa, 1989); Pierre Gaudibert et al, Wifredo Lam (Düsseldorf: Kunstsammlung Nordheim-Westfalen, 1988); Pontus Hulten, Wifredo Lam (Stockholm: Moderna Museet, 1967); Ulrich Krempel, Wifredo Lam (Paris: Galerie Lelong, 1988); Michel Leiris., Wifredo Lam (NY: Harry N. Abrams, Inc. 1970); Michel Leiris et al, Wifredo Lam 1902-1982 (Paris: Musée d'Art Moderne de la Ville de Paris, 1983); Wifredo Laurin-Lam, Wifredo Lam: Catalogue Raisonne of the Painted Work Volume I: 1923-1960 (Lausanne: Acatus, 1996); Ministerio de la Cultura de Espana Y Ministerio de la Cultura de Cuba, Homenaje a Wifredo Lam 1902-1982 (Madrid, 1982; catalogue to accompany the retrospective exhibition at the Museo Nacional de Arte Contemporáneo, Madrid, the Musée d'Art Moderne de la Ville de Paris, and the Musée d'Ixelles, Bruxelles); Centro del Arte Reina Sofia, Wifredo Lam (Madrid: Centro del Arte Reina Sofia, 1992); Lowery Stokes Sims, Wifredo Lam and the International Avante-Garde, 1923-1982 (Austin: University of Texas Press, 2002); Philippe Soupault, Wifredo Lam: Dessins (Dutrou: Editions Galilee, 1975); Patrick Waldberg, Wifredo Lam (Amsterdam: Stedelijk Museum, 1967). Croiseur Noir VI / Black Cruiser 6 (L7106). Original color etching, 1972. 25 signed and numbered impressions plus 125 unsigned impressions, of which this is one. Image size: 149x123mm. Price: $850. Les demeures d'Hypnos (. L7512). Original color lithograph, 1975. 99 signed and numbered impressions. 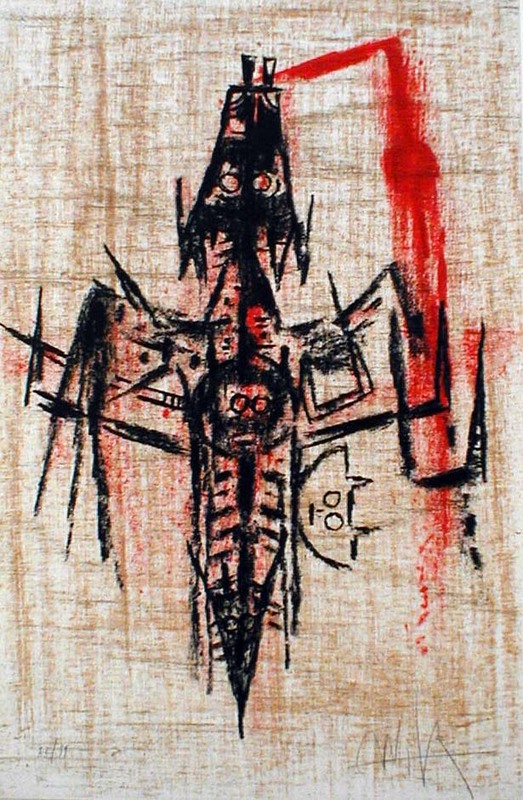 This work was exhibited in a 1983 exhibition in Stockholm. Image size: 498x324mm. Price: $2750. Double personnage (L7513). Original color lithograph, 1975. 99 signed and numbered impressions on Arches paper plus x artist's proofs and 25 HC impressions. Image size: 318x248mm. Price: $1750. Oiseau de possible (L7514). Original color lithograph, 1975. 99 signed and numbered impressions on Arches paper plus x artist's proofs and 25 HC impressions. This print is illustrated (unfortunately turned upside down) on the cover of the catalogue raisonné of Lam's prints published by the Musée Gravelines. The print was published by XXe Siecle, who also published an unsigned color variant with no margins. Image size: 318x248mm. Price: $1750. A Sceve, A Diane (L. 7511). 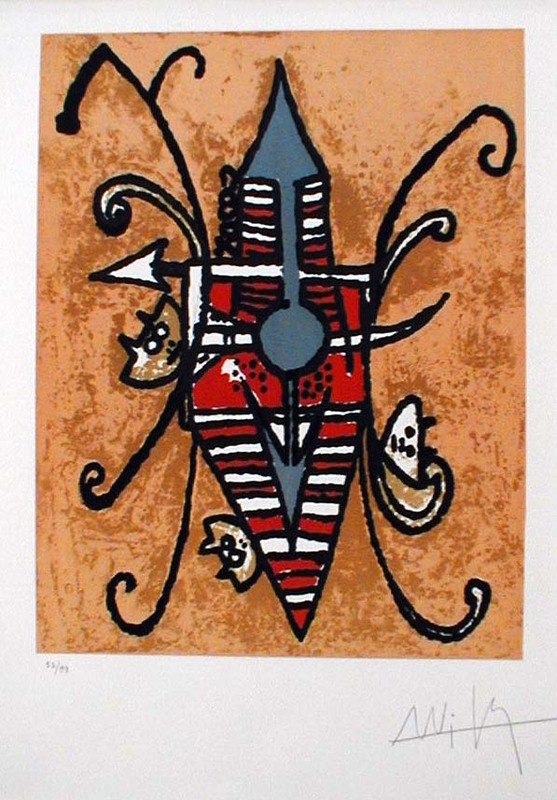 Original color etching and aquatint, 1975. 75 signed and numbered impressions. Image size: 265x205mm. Price: SOLD. Composition for Redfern Galleries (LNE8005). Original color lithograph, 1979. 100 signed and numbered impressions plus 1000 unsigned impressions. Image size: 253x16mm. Price: $850.